“These are the four that are never content: that have never been filled since the dew began- Jacala's mouth, and the glut of the kite, and the hands of the ape, and the eyes of Man.” - Rudyard Kipling, Jungle book. Jungle book is not only a book or a show which made my childhood, it is an emotion. The extraordinary tale of Mowgli is still engraved deep in my mind. The lyrics of the famous song still linger in my mind even after so many years. I have used a light pastel green as a base. 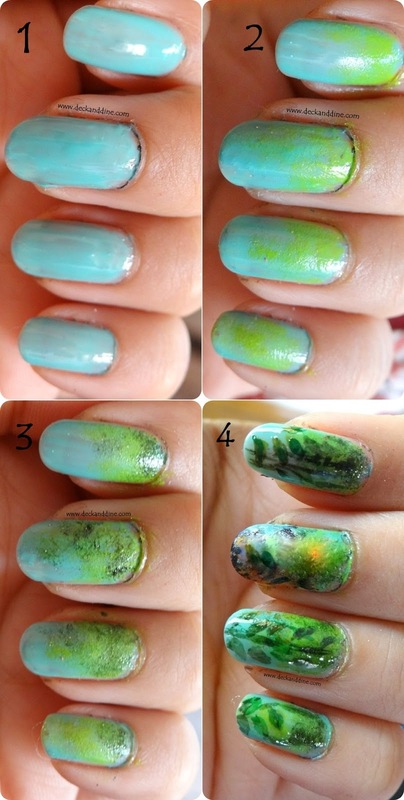 Then I sponged a light leaf green and a dark green around on the nails. Used shades of green acrylic color to draw branches and leaves. Experiment. Mowgli, Baloo and Sher Khan are free hand using acrylic paints. Seal the paint with a non-streaky top coat. Anyway, let me know your thoughts. I am all ears today. Pour in your honest opinions.